Tomato corn bruschetta is a delicious appetizer which can be made pretty easily. You can skip the sweet corn or American corn and make ‘Tomato Bruschetta’ using tomatoes only. You’ll love it any way you try. 1. In a bowl, mix garlic paste, salt, pepper, butter and olive oil. 2. Apply a thin layer of this paste on each slice of French bread. Heat a griddle (tava) and lightly toast these slices on it. Set aside. 3. Now for the topping, heat olive oil in a pan and add tomatoes. Stir fry for few seconds. 4. Add sweet corn, oregano, salt, red chilli flakes and crushed peppercorns. Sauté for 2 minutes. 5. Spread 2 tsp topping on each slice of toasted bread. Preheat oven at 180 C for 10 minutes. 6. Bake these bread slices in preheated oven at 180 degree C for 5 minutes or till crisp. 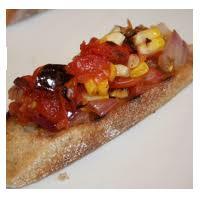 Serve tomato corn bruschetta hot.